Hard to believe we are almost finished with 2017. It seems like the past year has really flown by. And while I would love for time to slow down a bit, the end of every month let’s us do something fun … publish our dividend income results. November was another awesome month for earning dividend income from our taxable accounts. We refer to the stocks we own in these taxable accounts as The Money Sprout Index. Overall, this index contains 30+ awesome companies that pay us dividend income. As each month passes, we typically are posting 20% to 40% increases from the same month the previous year. And this past month … our results did not disappoint with a 35% increase compared to last November (2016). I have mentioned it here many times, but this growth comes from 3 unique sources. First, we continually reinvest all of the dividend income earned each month. So the $1,900+ earned in 2016 was all reinvested into more dividend stocks. Second, almost every single company we invest in gives out a raise each year in the form of a dividend increase. On average, we earn a 6% raise each year from the companies we own … pretty cool! Finally, the majority of the growth in our dividend income is driven by new investments. We have been trying to invest 20% to 25% of our income for the past year. That is where most of our growth is coming from. We recorded our highest November dividend income results of all time. And while it was certainly not a surprise, it still helps to see our dividend income grow and compound month after month and year after year. We earned an awesome $168.21 in dividends from stocks that we own during November. That $150+ in side income could be used to pay for a bunch of items in our monthly budget like – gas and electric bill, water bill, internet and phone bill, and a whole bunch more. I love the thought of being able to replace part of our expenses with real passive income like we are earning from dividend stocks. Of course, we have no plans to use this income to pay off bills anytime soon, and plan to reinvest it so we can continue to grow and compound our dividends. We saw an increase of 35.1% last month compared to November 2016! This latest increase shows all the new capital we have invested into the market over the past year is working very hard. Overall, we had 9 stocks pay out a dividend in November. Solid dividend paying companies like Verizon, Lowe’s, and CVS gave our family a paycheck … and we didn’t have to do very much to earn it! Continued reinvestment’s and company dividend increases paved the way for this growth. Note – All of the dividends we currently receive are reinvested into new shares of the same stock using DRiP – except those purchased through our Robinhood account. This past year, we have been focused on growing our forward annual dividend income to $3,000 by the end of 2017. We set this goal last November (2016) and have been busy investing new money into dividend stocks ever since then. At this point, it doesn’t look like we will hit that target … but it doesn’t mean we are giving up on investing new dollars. Note – All of these investments were made through our Robinhood and transfer agent (CINF and XOM) accounts … which means we did not pay any commissions or fees on these trades. Note – I would like to point out that these new investments were made in our taxable investment accounts. In recent months, we have focused a little more on building our tax deferred accounts like a 457 plan and our IRA’s. That is one reason why our new investments listed above have been down since August. The dividend income earned in November ($168.21) was up over 35% from the same time last year. If we could repeat that growth month after month and year after year … that would be awesome. However, that is likely unattainable but still great to see this past month. On top of the growth, for the first time ever we topped $150 for the month of November. This is another little milestone that we hit and will help motivate us to keep building and growing our sustainable income stream. Unless we see a bunch of dividend cuts, it is safe to say we will earn over $150 per month moving forward. All of the increases this past month were from a combination of new investments made, dividend reinvestment’s, and company dividend increases. Speaking of company dividend increases, we received several last month including – Hormel (HRL) at 10.3%, Sysco (SYY) at 9.1%, and Emerson Electric (EMR) at 1.0%. Overall, those increases will increase our future annual dividend income by – $5.49. When it comes to yearly goals, we originally were trying to earn $2,400 in dividend income in 2017. 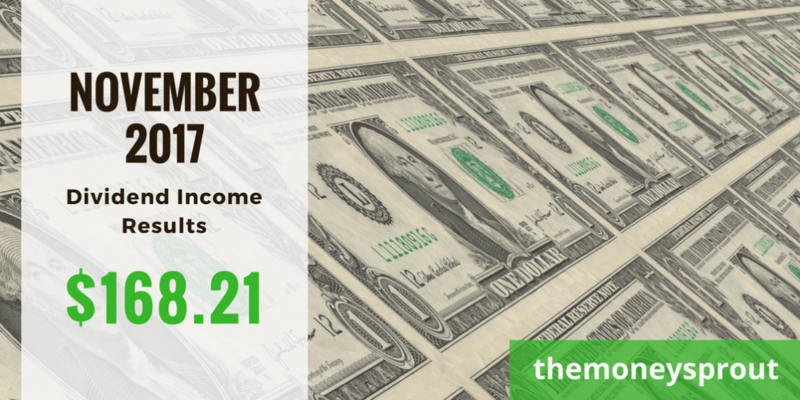 With November’s results, we have now earned a total of $2,202.85 in dividends for 2017 … which means we need to earn around $198 the remainder of the year. Unless there is a major catastrophe … we will blow that total out of the water. Based on estimates, it looks like we could possibly hit $2,600 after our December dividends are paid. It will be close! And now that we know we are on track for 2017, it is time to start thinking about our goals for 2018. At this point, we are going to try and shoot for earning $3,000 in dividend income in 2018 from our taxable accounts. How was your dividend income in November? Full Disclosure – At the time of this writing, we owned shares in the following stocks noted in this post – AAPL, CAT, CINF, CLX, CVS, EMR, HRL, KR, LOW, O, OHI, PG, QCOM, SYY, VZ, and XOM. The material above is not a recommendation to buy. Please do your own research on a company before deciding to invest.